Strong weather systems coupled with the hot weather have not been ideal fishing conditions. Much cooler temperatures moving in will certainly help push more fish into the rivers. Inland lakes were producing panfish. Lake Erie: The perch bite was slow however fish were found in 22 to 24 feet near the E-Buoy and the Dumping Grounds or 15 feet in Brest Bay. A couple limit catches were taken in 24 to 26 feet east of Stony Point and in 28 feet off Fermi. The bite was best between 1-3:30 pm. Most were using minnows on perch rigs with or without green, orange and chartreuse spinners. Limits were caught with ultralight rods and perch rigs with no spinners on the bottom. A few walleye were caught on bandits near the Dumping Grounds or husky jerks east of Buoys 1 & 2. Large and smallmouth bass were caught around the Toledo Beach Marina when casting artificial lures. The Hot Ponds continue to produce a good number of catfish for those using crawlers. Huron River: Usually has good bass fishing this time of year. Detroit River: Continues to produce yellow perch but not in big numbers. Fish have been caught around the islands and at the mouth of the river in 14 to 17 feet. A few walleye can still be found down at the mouth. Lexington to Port Sanilac: Lexington had pleasure boaters. A few lake trout and walleye were caught in 120 to 160 feet off Port Sanilac. Pier fishing was very slow. Harbor Beach: Some lake trout and a couple walleye were taken about halfway down in 120 to 150 feet. Port Austin: Boat anglers casting tube baits caught smallmouth bass. A few walleye were caught by those trolling crank baits out near the reef. Saginaw Bay: Though slow and steady, some perch and a few walleyes were taken in 10 to 15 feet off the Saganing and Pinconning Bars. Perch were caught from several locations including 16 feet of water off Linwood, the Crib, Sailboat Buoys G & H, and off the mouth of the Saginaw River. A fair number of fish ranged 10 to 12 inches. A couple walleye were caught incidental by perch anglers using minnows. Fishing along the east side of the bay was slow but a couple walleye were taken from the edge of the weed beds along the shallow side of the Slot and off the islands in eight to 12 feet. St. Joseph: Poor weather has hampered fishing. Good numbers of lake trout were caught in the bottom 20 of waters 120 feet deep. Perch and pier fishing were slow. St. Joseph River: Had very little salmon movement. The lower river had some decent walleye fishing for those trolling small crank baits. South Haven: Salmon fishing was hampered by the rough conditions. Lake trout could still be found in 80 to 100 feet. Perch fishing was fair to good with a decent number of fish taken in 40 feet. Almost all the perch caught were taken by those drifting. Pier fishing was slow. Black River: Has had very little salmon movement as it has been too warm. Grand Haven: Boats are catching a few Chinook and coho 65 to 130 feet down in 120 to 175 feet with white or green flies and green meat rigs. Pier anglers continue to take channel cats and freshwater drum on gizzard shad. Grand River at Grand Rapids: A few salmon were caught up near the Sixth Street Dam however the fish were few and far between because of the warm water. Anglers are using a mix of spawn, spinners, Cleo’s, thundersticks or flies. Grand River at Lansing: The odd walleye was caught near the dam over a Moore’s Park. Try a twister tail grub tipped with a minnow. Morrison Lake: Anglers caught bluegills, perch and crappie 15 to 20 feet down and near the bottom. Anglers were using perch rigs, crawlers and deep diving crank baits. Muskegon: Salmon action was slow for boat anglers. A few fish were caught 60 to 120 feet down in 100 to 160 feet with green flies and meat rigs. A few smallmouth bass were caught off the piers. Whitehall: Boats trolling 60 to 90 feet down in 150 to 225 feet caught Chinook, coho and the odd steelhead. Try glow spoons with green or blue on deep lines or orange and red spoons on sliders. Those still-fishing or drifting live bait in the channel caught largemouth bass and bluegills. White Lake: Walleye anglers trolling crawler harnesses in 15 to 25 feet reported spotty catch rates both early and late. Cheboygan: Anglers trolling J-plugs and spoons at the Red Buoy caught some Chinook salmon between 10-20 pounds. Some tried off Layfette Point on Bois Blanc Island but had no luck. Cheboygan River: The gates at the dam have been open for the past week and Chinook salmon have started to move into the river. A few were caught on spoons, crank baits and spawn bags. Very few walleye or smallmouth bass were caught when drifting worms and leeches. Rogers City: Anglers continue to take a mix of salmon, lake trout, steelhead and walleye in 20 to 90 feet. The fish are scattered so run lines throughout the water column. Spoons, J-plugs, bombers and flashers with flies, squid or cut bait were all productive. Good colors were green, blue, black and white, purple or glow early and late. The better fishing has been an hour before daylight or an hour just after sunset. Chinook salmon were staging off Swan Bay. Alpena: Anglers caught lake trout along with the occasional Chinook, Atlantic or steelhead. The lake trout were near the bottom while the other fish were about halfway down in 70 to 120 feet. Lake trout were hitting on flashers with flies and spin-glo’s while the salmon and steelhead were hitting on spoons. Thunder Bay River: Had rumors of a couple Chinook and Atlantics caught up near the dam at night but no fish were verified. Those using live crawlers caught the occasional channel cat, freshwater drum, rock bass, smallmouth bass and even a small walleye. Black River: A few walleye up to 22 inches were caught by those trolling reef runners, husky jerks and other crank baits in 25 to 35 feet between here and Sturgeon Point in the early morning. A few small yellow perch were caught on crawlers at the mouth of the Black River. Harrisville: Fishing picked up with a few good catches of lake trout taken from the bottom 30 feet. Atlantic and Chinook salmon were caught up higher. Spoons were a good bet however dodgers and flies were also taking Atlantics and lake trout. Walleye were found in 20 to 40 feet during the lowlight hours or suspended in the top 40 out to 100 feet deep. Oscoda: Anglers found lake trout when trolling spoons and spin-glo’s in the bottom 30 of waters 60 to 140 feet deep out from the mouth of the river and around the drop-off. A few Atlantic, small Chinook and steelhead were taken on spoons below the temperature breaks with many fish marked 50 to 80 feet down. A couple Chinook were moving closer to the mouth of the river and in shallow waters 60 feet deep. Pier anglers caught channel cats, freshwater drum, rock bass, and smallmouth bass of all sizes when still-fishing with crawlers and leeches or casting crank baits. Au Sable River: The lower river had cooled slightly and was producing channel cats, freshwater drum, smallmouth bass, green sunfish and rock bass for those still-fishing or drifting crawlers. A few pike were taken by those casting spoons in the weedy still-waters. The upper river from Grayling to Alcona Pond had cooled so trout should be feeding more aggressively. Try streamers and terrestrial flies this time of year. Higgins Lake: Perch were caught on the northwest side of Treasure Island and on the southwest end of the lake off the Gerrish Township Marina. Smallmouth bass and rock bass were hitting on crawlers near the Sunken Island. Houghton Lake: Fishing was slow with only a few walleye, pike and bluegills caught. The bite was not consistent. The only good bite seems to be from the rock bass. Try early morning or late evening and if your normal gear and techniques are not working, try just a plain hook with a worm or leech. Tawas: Still had a few walleye taken around the weed beds near Buoys 4 & 6 inside the bay. Those trolling out near Buoy #2 and beyond caught a couple walleye, steelhead, Atlantics and one Chinook. Au Gres: Walleye fishing was slow, but some were caught near the Bell Buoy off Whitestone Point in 40 to 50 feet or straight off the mouth of the river in 30 feet. A few perch were caught near the NOAA weather buoy in 30 feet. Au Gres River: Those casting for bass or trolling for pike have caught fish. Overall: Those targeting salmon are reminded that snagging is illegal. Treble hooks are also illegal unless attached to a true lure. For additional information look on page nine in the 2019 Michigan Fishing Guide under “Artificial Lure”. Bear River: Near Petoskey had quite a few anglers targeting salmon at the dam. Chinook were taken on spawn or flies. Undersize trout were also caught. Charlevoix: Boat anglers caught a few Chinook and some lake trout. Pier anglers caught undersize smallmouth bass. Traverse City: Fishing in the East Bay was hit-or-miss. Salmon and lake trout were caught south of Deepwater Point towards Acme Creek or north and south of the M-37 launch in 80 to 130 feet. A couple cisco were caught. Lakers were caught by those jigging around Deepwater Point in the early morning. Bass were taken in 10 to 20 feet. From Elk Rapids, salmon were marked but lake herring were caught straight out from the marina. The Elk River was slow. A few salmon are in the river but very few had been caught. In the West Bay, mornings were best for salmon. Those trolling caught fish at the south end from the hole out from the Boardman and north of the hole and slightly west towards Elmwood. Perch fishing was slow around the island and Lee Point, but a few were caught in Northport. On the Boardman River, salmon have been caught on spawn, skein and body baits at the dam. Glen Arbor: A couple Chinook, coho, cisco and near limit catches of salmon were caught along the first bank. Frankfort: Those trolling and jigging in the bay and around the pierheads have landed several Chinook and coho. Those in Platte Bay reported hit-or-miss coho action. Those jigging seem to have better luck. Smaller boats are launching from Platte Bay however they are walking their boats through the shallows. The coho run on the Platte River had been slow. Betsie River: Chinook salmon have moved into the river and anglers were reporting very good numbers at the Homestead Dam. Anglers are reminded that snagging is illegal, and treble hooks are illegal unless attached to a true lure. Portage Lake: Anglers searching for coho while trolling the channel area were marking fish but were unable to get them to bite. Bass, perch and panfish were slow. Manistee: Surface temperature readings were about 70 degrees. Chinook fishing slowed but coho were hitting on spoons in 180 to 250 feet. Trolling has been tough because of the deep thermoclines. Many of the Chinook salmon have moved into Manistee Lake and up in the rivers. Pier fishing for salmon was good at times. Manistee River: Had lots of anglers fishing for salmon. Anglers are reminded that snagging is illegal and using a treble hook is illegal unless it is attached to a true lure. Ludington: Surface temperatures were about 72 degrees. The wind and strong thunderstorms have pushed Chinook salmon into Pere Marquette Lake and the river. Those out trolling 70 to 100 feet down in 300 to 400 feet caught coho, steelhead and lake trout on spoons and flies. Pier fishing was slow. Pere Marquette Lake: Many anglers were still having success and catching Chinook salmon when jigging or trolling. Pere Marquette River: Had a good number of anglers targeting salmon. Anglers are reminded that snagging is illegal and using a treble hook is illegal unless it is attached to a true lure. Pentwater: Anglers trolling 70 to 100 feet down in 170 to 250 feet caught Chinook and coho salmon on green or glow spoons. Meat-rigs were not producing. Orange spoons on high-lines were taking the occasional steelhead. Pentwater Lake: Those drifting minnows along the bottom caught the occasional smallmouth bass, channel cat or freshwater drum in the channel. Those floating red worms under a bobber caught perch, rock bass and bluegills from Longbridge Road. Lac Vieux Desert: Bass anglers did well with spinners and top-water lures. Pike were also caught in the shallows around the weed beds. Muskie anglers caught a few but most were getting pike. Panfish anglers stayed busy however sorting and persistence is the name of the game when it comes to getting the bigger fish. Natural or artificial grubs worked best along the weed beds. A couple small walleye were caught. Little Bay De Noc: Fair to good walleye catches were reported when trolling a crawler harness or stick baits in 12 to 16 feet off Breezy Point, south of the Ford River in eight to 14 feet, and off the mouth of the Whitefish River in 12 to 18 feet. The Gladstone Bay area out from the Terrace Inn was good at times in 35 feet but the “Black Bottom” was best when using stick baits in 16 to 25 feet in the early morning or at dusk. Perch anglers reported fewer catches but some nice jumbos were taken. Fair catches were reported off Gladstone Beach in 18 to 25 feet and off Kipling in 22 to 24 feet. Smallmouth bass have started moving south however fish were still being caught either south or straight out from the Ford River with plastics in 12 to 18 feet and along the southern end of the “Black Bottom” in eight to 15 feet. Big Bay De Noc: Still had good bass fishing but anglers report the fish are starting to move south. Marquette: Boat anglers were still doing well for lake trout in the white rocks and Granite Island areas. Some switched to salmon fishing but very few had any luck. Many are trolling in front of the Chocolay River, Shot Point and 50 to 70 feet down inside the harbor. Those targeting salmon seem to be picking up bigger lake trout. No reports from Stannard Rock but this time of year it is very important to watch the weather when taking trips that far out. River fishing started to pick up slightly near the dam on the Dead River or the Carp River. Au Train: Boat anglers had good luck with lake trout north and west of Au Train island when trolling or jigging. Salmon anglers had no luck. Surface water temperatures were still in the low to mid 60’s so we need cooler temperatures. Munising: Surface water temperatures were still in the upper 60’s. Lake trout anglers did well northwest of Grand Island and towards Wood Island Reef. Salmon anglers have not reported any fish in the past few weeks. Grand Marais: Continues to provide excellent lake trout fishing especially east of Big Reef, off Five Mile Reef and off the Au Sable Lighthouse. Very few coho have been caught by boat anglers. Surface water temperatures remain in the upper 60’s. Two Hearted River: Has a few salmon. Those fishing near the river mouth campground had some luck. St. Marys River: Walleye anglers reported good catches off Raber Point which is about two miles south of the boat launch at Raber. Most were trolling planer boards with pencil plugs just off the weed beds in eight to 12 feet. Try fishing the mouth of Carlton Creek in the early morning or late evening. Some nice pike were taken by those trolling or casting spinner blades up near Point Aux Frenes. Detour: Had good walleye fishing north of Detour Village. Good catches reported near Swedes Point when trolling bottom bouncers and crawler harness with purple beads and smiley blades. Boats were trolling 1.5 mph and pulling baits across the underwater humps or across the rocky points in 14 to 18 feet. Trout and salmon fishing at the Detour Reef and Lighthouse was steady. Darker colored spoons worked well for the Chinook and Atlantic salmon during heavy cloud cover. The thermocline was holding at 55 feet. Anglers are reporting that the Chinook salmon are moving further upstream from the lighthouse to begin their pre-spawn run. Fish Fry Pan Island to the green buoy and northwest to the lighthouse with baits set 55 to 60 feet down in 90 feet. Strong winds and fog kept anglers from going beyond the lighthouse to fish for lake trout at the 90-foot flat. Cedarville and Hessel: As we move closer to fall, yellow perch fishing continues to get better at Cedarville. Anglers caught fish up to 11 inches when drift fishing the 12-foot channel in Cedarville Bay. A few were caught under the docks at Viking Boat Works. Use shiners or small worms. Good pike catches in Musky Bay at Connors Point early morning or late evening. Bigger fish were taken on creek chubs in 12 to 17 feet between Peck Bay and Little La Salle Island or at the Middle Entrance to the Les Cheneaux Islands. In Duck Bay, largemouth bass were hitting on spinners in six feet. From Hessel, those targeting splake were heading one mile straight south of the pier, off Coats Point and off the west side of Marquette Island when trolling orange, chartreuse and black crank baits in 12 to 18 feet. Those jigging an orange or gold 4-inch spoon caught fish ranging 21 to 24 inches. The Hessel Marina and finger docks had no perch reports. Pike were caught in Wilderness Bay when trolling large bucktail spinners with yellow spotted blades just off the weed beds in six to 12 feet or out deeper in 12 to 20 feet. 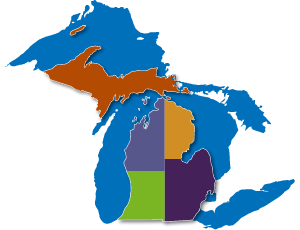 For more information on bass in Michigan, visit their page on the DNR’s website.